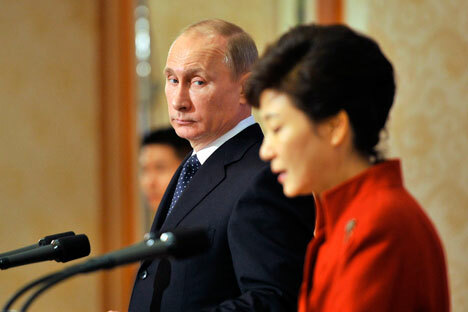 South Korean President Park Geun-hye (R) and Russian President Vladimir Putin during a joint news conference at the presidential Blue House in Seoul. South Korean President Park Geun-hye asked Russian President Vladimir Putin to help revive the six-party dialogue on North Korea’s nuclear disarmament, The Korea Herald reported on Dec 2. “I am asking for Russia’s active role in making North Korea face reality and have a rethink on its nuclear problem in order to resume meaningful talks on (North Korea’s) denuclearization,” Park said, according to the paper. The leaders met on the sidelines on the U.N. Climate Change Conference in Paris.